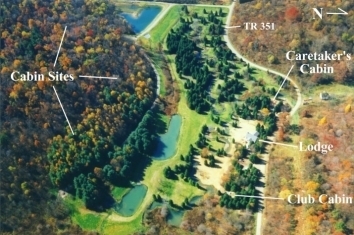 The property consists 32 acres of land, 3 ponds, 3 rearing ponds, 4 springs, a central furnished lodge facility which contains 2 guest quarters, a guest cabin, a caretakers cabin, and approximately 3,200' of the Wolf Creek. We are also developing ten 1-acre cabin sites on the hill overlooking the valley. 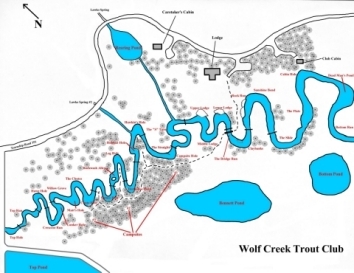 Wolf Creek was initially stocked in May of 2000 with a combination of rainbow and brown trout. We stocked adult brown and brook trout in March of 2001, and raised 4,000 of our own fish in 2001. The rainbow trout that we stocked in 2000 spawned during the spring of 2002, and we are now seeing large numbers of rainbow trout fingerlings in our stream system (we estimate between 500 and 2,000). The brown trout that spawned in the fall of 2001 were unsuccessful due to heavy runoff. It is our belief that the eggs washed out of the gravel due to the tremendous water volumes that we experienced. March 18, 2001 one of our members reported catching a 4" brook trout, which would indicate that we had a successful brook trout spawn in October of the previous year. We have stocked our three ponds with several different species: rainbow, brown, and brook trout in the lower two ponds (beginning in 2000). And largemouth bass, bluegill, and black crappie in the upper pond (2001). We continue to restock adult trout in the steam and ponds from time to time. Our trout range in size from 4"-7" (wild rainbows and brooks) to 36" browns. The average size trout caught is approximately 16 inches but it is common to hook into 20+ inch fish. In 2001 we performed an inventory of our "middle pond" and discovered we had approximately thirty brown trout exceeding 30", with the largest appearing to be around 36". Our fish receive more than 96% of their diet from natural sources. For further information please contact Rick Davis at (740) 824-5507.